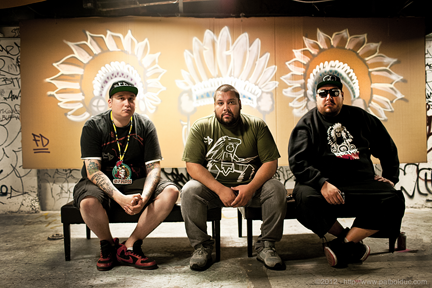 Bursting forth from Canada’s capital, First Nations Producer/DJ crew A Tribe Called Red is making an impact on the global electronic scene with a truly unique sound. Made up of three members, DJ NDN (Ian Campeau), Bear Witness (Thomas Ehren Ramon) and DJ Shub (Dan General), the group has created a distinctive style, a mix of traditional pow wow vocals and drumming with cutting-edge electronic music. In 2010 they added 2 time Canadian DMC Champ, DJ Shub to the crew, completing a signature sound made up of a wide variety of musical styles ranging from Hip-Hop, Dance Hall, Electronica, and their own mash-up of club and Pow Wow music. The trio quickly garnered a local following — not just urban First Nations teens, but also dubstep fans drawn to the group’s eclectic mix of beats. A true audio-visual and cultural phenomenon catch A Tribe Called Red at the 21st Annual Salmon Arm Roots & Blues Festival.